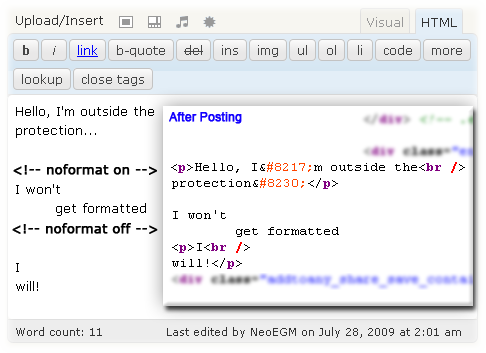 Published on July 28, 2009 in Plugins. 34 Comments Tags: Blogging, convert_chars, Download, Format, Freeware, GNU GPL, HTML, Open Source, PHP, Plugin, Source Code, WordPress, wpautop, wptexturize. For the ones used to work with WordPress editor’s HTML mode and hate when it creates <p>s and reorganize <br/>s on its will (among other things), I’ve made this plugin. on the WordPress editor, just before the part you want to protect, and from that point on, WordPress won’t touch the HTML code you write. Here is the change log.